Vishna Bai’s eye lit up, as the portly, cheerful farmer rapidly listed the year-round bounty her hectare of land produced until February 2016, when the excavators came and razed her beloved crops. Illiterate, Vishna Bai is in her 40s--she was not exactly sure--and like 20 fellow Bhils from India’s largest tribe, is now officially an “encroacher”. Their farms were classified “small and marginal” with an area less than 2 hectares, much like 86% of India’s farms, according to the Agricultural Census, 2015-16. Here on the southern outskirts of Ratlam, the Bhils, after tilling the land for at least half a century, were evicted from nine of a 32-hectare spread of rocky, undulating land--the size of 60 football fields--that was marked for an industrial park in 2009. The Bhils claim to have farmed over 20 hectares of the land. Though the industrial park never came up, in 2013, the government carved out 18 hectares of the property for a cluster of namkeen (snack) industries, primarily to make the spicy local savoury unique to the region, called Ratlami sev. Evictions began three years later over the nine hectares of Bhil farms that fell within the proposed cluster. Further evictions were stopped after a three-year legal battle by the Bhils led to two court stay orders, one from the Supreme Court. The 21 Bhils have neither been paid compensation nor offered rehabilitation because of a legal situation we could call the tragedy of the commons, which now features in 456 land conflicts affecting more than 3 million Indians. As for the sev, the irony is that it was invented by the Bhils more than 200 years ago. But more on that later. The land that Vishna Bai and the rest of the Bhils have been farming for 50 years or more--some farmers said their families have been here for 80 years--are part of a village commons, whose title is held by the district administration. Such commons are not covered under the Right to Fair Compensation and Transparency in Land Acquisition, Rehabilitation and Resettlement Act, better known as the Land Acquisition Act, 2013, which provides for compensation to people whose land is taken over for public projects but only when the land is privately owned. The law protects people farming on commons in only two cases: One, in forests where the Forest Rights Act, 2006, recognises the rights of tribal adivasis--as India’s original people are called--and other forest dwellers to the land; and two, in so-called “scheduled areas”, adivasi-dominated regions where projects need collective consent of the community under the Panchayats (Extension to the Scheduled Areas) Act, 1996. Ratlam is not a scheduled area, and the Bhil fields are not near forests. So, they were treated as encroachers on public property. There are, currently, 456 land conflicts in India involving commons, as we said, affecting over 3.3 million people and 19,000 sq km, equivalent to half the area of Kerala, according to Land Conflict Watch, a network of researchers tracking land conflicts nationwide. These conflicts constitute two-thirds of all the 678 ongoing general land conflicts reported by the network. In the absence of mandatory resettlement or compensation, people dependent on commons, such as the Bhils in Ratlam, are simply evicted. The Housing and Land Rights Network, an advocacy that campaigns against forced eviction of the poor, recorded more than 200 cases of forced evictions in 2017 alone, affecting 260,000 people. Evictions for industrial and infrastructure projects accounted for 53 cases, the second most common reason for eviction after slum evictions in cities. Communities evicted from commons are typically landless and marginalised, so getting legal protection can be a long, expensive adventure, as Ratlam’s Bhils can attest. Their plea before a local court to let them use the commons meandered through four stages of appeals over three years before ending up as a contempt petition before the Supreme Court in New Delhi. The Bhils are pitted against a resourceful, determined district administration and the makers of Ratlami sev, who are equally keen on the food-processing park. For the sev makers of Ratlam, a legacy and their livelihoods--much like the farmers--is at stake. Once the seat of a kingdom, Ratlam is today a town in western Madhya Pradesh, a has-been commercial hub known for sarees, gold and Ratlami sev. Only the sev is truly unique to the town--its recipe was developed here over the last two centuries. Its history was revealed when Ratlami Sev was granted a geographical indication (GI) status in 2014. In Ratlam, the sev occupies a unique place. It is a snack, a side-dish, a garnish and an ingredient. The local breakfast favourite, poha, is served with sev, preferably of two kinds. Curries are prepared with sev. Even if the food does not normally require sev, a handful is served on the side. For all its popularity in the district, Ratlami sev has been left out of the nationwide growth in packaged snacks, from potato chips to Haldiram’s-style Indian savouries. Gandhi is concerned that Ratlami firms are losing out to companies from neighbouring Indore and Gujarat, which have built big savoury businesses and even capitalised on the Ratlami sev brand. The turnover of Ratlam’s namkeen makers, Gandhi estimated, is about Rs 15 crore or a tenth of what one big company in Indore makes. Although nearly 2,000 businesses make and sell sev in Ratlam, all are backyard operations, none has a supply chain outside the district and nearly all the product is sold at storefronts to local customers. In Ratlam’s market, it is hard to miss the namkeen shops, their glass displays of yellow-gold-brown savouries framed against men hunched over giant, street-side woks of boiling oil. Surrounded by pedestrians and traffic, the cooks press yellow dough through a sieve placed above the oil. The larger namkeen establishments, such as Janta Sev Bhandar, which belongs to Gandhi, fry sev in enclosed kitchens near the shops. Since 1977, Gandhi has run his shop on a lane barely three-metres wide in a cloth market. His sev-making unit on the third floor of his building caught fire last year. Gandhi said it was necessary to move out of backyard kitchens to grow business and maintain safety. In 2013, the government agreed to the Namkeen Mandal’s demand for an industrial area where sev could be manufactured in bulk and its quality certified in laboratory. 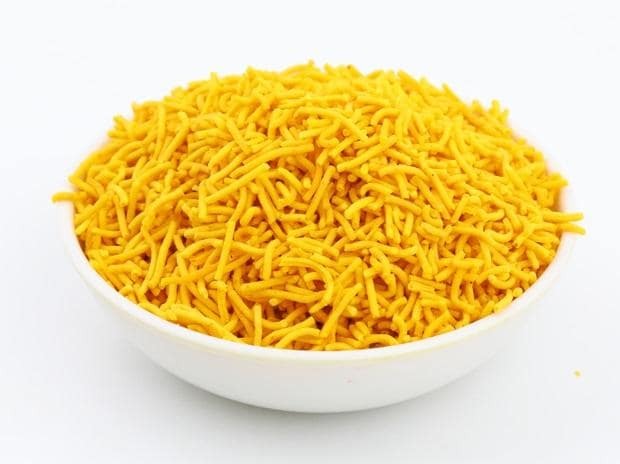 In its funding application to the union ministry of micro, small and medium enterprises, the Madhya Pradesh government said the Ratlami sev industry was hampered by “lack of basic infrastructure”, “inefficient production process” and “lack of quality and standards”. In June 2014, then chief minister Shivraj Singh Chouhan laid a foundation stone for the namkeen cluster in Karamdi. A contractor was selected and on February 10, 2016, tractors and earth movers headed to Karamdi, to the fields of ripening gram and green chillies of Vishna Bai and her 20 fellow Bhils farmers. “I still remember the contractor, that thin man,” Vishna Bai said, glancing furtively at what was once her farm, now an empty plot. Its borders were paved with concrete, street lights arched over where her crop thrived, and high-capacity electricity wires criss-crossed what was once open sky. A bucket-sized water pump, an axe, a sickle and one hectare land: This was all that she once needed to feed her family of seven and build a two-room concrete house for herself. The outer room was bare, save for two beds, and a small television set was placed on a pedestal next to posters of Hindu gods. When the tractors and a backhoe excavator arrived that morning, women were working on the fields. “There were just the few of us in front of all those men,” Vishna Bai recalled. One of them, Kodri Bai, said she stood resolutely in front of the excavator, but the officials were adamant. “They almost ran the JCB over me,” she said. With the land gone, an important source of food and income has been lost. The need to buy food has put greater pressure on Bhils to find whatever odd jobs they can. “They (the Patidars) give us the job of clearing dung” for Rs 250 a month, said Vishna Bai. Others had taken to selling vegetables on Ratlam’s pavements, earning them about Rs 200 a day, or plucking grapes at farms or working in brick kilns. When everything else fails, they stand at the town square each morning to be hired as labourers on construction sites. The land the Bhils once tilled is ready for a new kind of crop: The first batch of Ratlami sev may soon be produced at a unit set up by Ankit Luniya, a young entrepreneur who decided on the namkeen business because of the industrial park. There are concrete roads, a sewage-treatment plant, conduits for power and water supply, drains, and there may possibly be a testing and certification laboratory. Luniya said he was not aware of any farms on the rocky land. Gandhi of the Namkeen Mandal dismissed the Bhils’ claims as “bakwaas (bogus)”. “This is just a saazish (agenda) by the Indore namkeen lobby and opposition politicians because they don’t want our industry to grow,” said Gandhi. Bhil farmers still in possession of some of the land--about 11 acres--were vigilant. Bherulal (he uses only one name), the oldest of them at 70, spends most of his time in the fields. “Who knows when they will turn up again with tractors?” he said. Ratlam’s collector, Ruchika Chauhan, the head of the district administration, declined comment. In its affidavits to the lower courts, the district administration argued that the farmers were “encroachers” gaining “unauthorised” benefits by cultivating public property. The government argued that at least 3,000 jobs would be created in the namkeen cluster, and it would earn Ratlam a name “at world level”. There was no cultivation on the land as it was rocky, and the photographs submitted by the Bhil farmers were from “some other land”, the administration said. The Ratlam district administration has denied that there were any farms before the namkeen cluster was built. But satellite images of the site from 2003 and 2018 show that farms were indeed razed for the cluster. Satellite imagery courtesy Google Earth. Within a week of the eviction in February 2016, more than 15 Bhils, including those cultivating fields outside the park area, filed a civil suit in a local court, seeking permanent protection from being evicted from their farms. The district administration had tried evicting them in 2009 as well, when the food-processing park was first announced, but when it was not built, the farmers returned. In the courts, the Bhils have argued that they had farmed the land for nearly 80 years, and that their forefathers’ names were recorded in revenue surveys as far back in 1967. The 2016 Bhil petition to the Ratlam fifth civil judge’s court said that the land was originally “uncultivable”, and the Bhils put in ”hard labour” over generations to make it productive. Bherulal, whose father Rama Bhil is named in the old surveys, said they had migrated from nearby forests and settled on the land, which at the time belonged to Ratlam’s ruler Rattan Singh. The Bhils argued that since they had made the land cultivable, have “peacefully” possessed it and depended on it for survival, they should be granted titles. On February 29, 2016, the Ratlam civil court ordered a one-year stay on eviction. This started a three-year-long legal battle spawning a variety of cases at all levels of the judiciary. The temporary stay was challenged by the state government before a senior judge in Ratlam, who overturned the stay, observing that it was “crystal clear” that the Bhils were encroachers and could get no protection from the courts. An appeal filed against this decision by the farmers in 2016 before the Madhya Pradesh High Court was also dismissed. Finally, the farmers went to the Supreme Court, which in November 2016, issued notices to the state government and ordered a “status quo”. That meant that industrial construction had to be halted. But in April 2017, the farmers noticed that roads were being built on the razed fields, and the area was being fenced off. They went back to the Supreme Court, alleging a contempt of court and a violation of the status-quo order. The contempt case is still being heard. The chain of appeals leading up to the contempt petition pertains only to the temporary stay issued in 2016. The main case--seeking permanent protection--is still being heard by the Ratlam civil court. In January 2019, the Bhils filed a fresh case before the High Court of Madhya Pradesh’s bench at Indore, this time seeking land titles under a little-known 1984 state law, which said that all landless people cultivating government property on October 2, 1984, could own the land. The High Court issued notices to the state government, and it, too, ordered a “status quo”. Yet, users of commons, such as the Bhils, have no other option. “In the absence of rights-based laws related to housing and land, this makes it very subjective, and often dependent on whether the judge hearing the case is sympathetic,” said Shivani Chaudhry of the Housing and Land Rights Network. As the Bhils await legal resolution, they do not know that India’s Geographical Indicators Journal credited their ancestors with creating the sev that led to their eviction. The story goes that in the late 19th century, Mughal rulers on a tour of the region wanted sevaiyan (wheat vermicelli) but could not buy wheat. So, they ordered the tribals to prepare sevaiyan from gram flour, which led to the first recipe of Ratlami sev. “The name given to the vermicelli thus prepared was Bhildi sev, which is the predecessor of the present-day crisp delicacy called Ratlami sev,” noted an entry in the journal on November 27, 2014. Vishna Bai had no time for such information. She juggled a number of odd jobs and had rented a field to grow some crops. After being thrown out of her farm and fighting what appeared to be an unequal battle with the district administration, she had little doubt what could help. Republished with permission of IndiaSpend. You can read the original article here.